After the month-long wait at the end of the Elfquest Special One-Shot, Elfquest: The Final Quest #1 is here! Elfquest is a saga that has spanned more than thirty years. In fact, it’s the longest running fantasy series in comics. It’s co-created by Richard and Wendy Pini, with art by Wendy Pini, and features elves of every color, size, and shape. My first recommendation: if you’ve only dabbled in Elfquest, have a wiki open when you start reading. Although you won’t need it for the story, there are lots of characters in this world, and their relationships are not often explained. I love Wendy’s art, and I can’t get enough of the vibrant, classic fantasy look of the series. As in: I want to frame every panel of Leetah and Cutter. 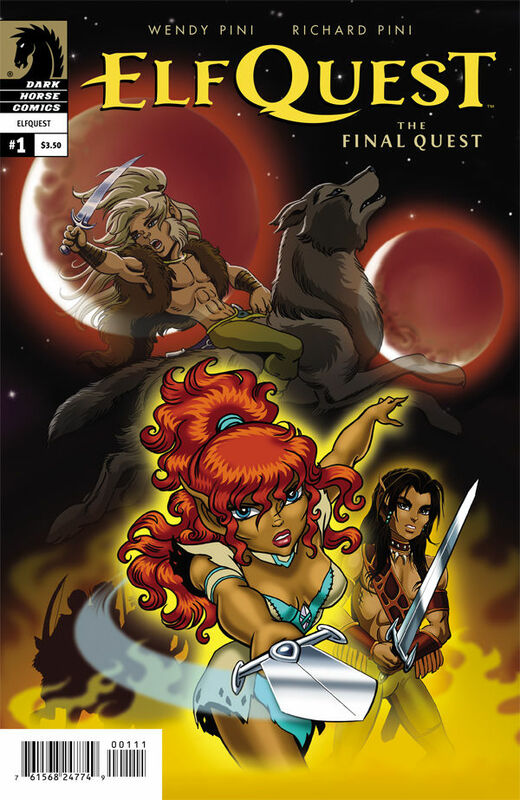 The writing is the usual fare for Elfquest readers, and is simple enough for kids to enjoy (if you don’t mind a little death) but entertaining enough for adults. Along with the actual issue, there’s tons of extra content, including images of the first logos, how to get the font on your own computer, and other artwork. I don’t even think I have to recommend this comic to lovers of the series…they’re probably already reading it. But to those of you who’ve only dabbled, I still recommend reading this and the one-shot, as well as some wikipedia articles. It’s totally worth it for the wild ride! The Wolfriders’ chief, Cutter, knows that change is coming. His tribe’s proximity to the Palace of the High Ones, a mysterious and magical oasis, makes this inevitable. As Cutter’s daughter Ember, chief of her own tribe, shares her father’s efforts to preserve the old ways amongst their kin, the human tyrant, Angrif Djun, ascends the mountain her clan call home and rocks the foundation of their peaceful existence.